Cambridge Audio launches Minx Air wireless speakers and new online store | What Hi-Fi? 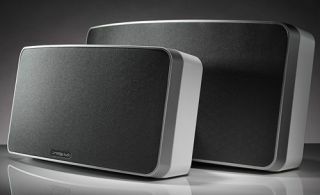 Cambridge Audio has released its new Minx Air wireless speakers, avaialble in two sizes, the Cambridge Minx Air 100 and Cambridge Minx Air 200 are on sale now from Cambridge Audio's brand new online store. The speakers support Apple AirPlay and Bluetooth, including the superior aptX codec, and have an internet radio, and both RCA and aux inputs, too. Naturally, Cambridge Audio will want to major on sound, too. The 100 and 200 speakers both use BMB (Balanced Mode Radiator) speakers, which traditionally aim to disperse sound better than standard drivers, making for a bigger, room-filling sound. The Minx Air 100 delivers 100 watts of power from its 2 x 4in BMR drivers, which are inside an 18cm tall by 35cm wide cabinet. Step up to the Minx Air 200 and you get 200w of power, 2 x 2.25in drivers and the bonus of a 6.5in active subwoofer. It's slightly larger to accomodate the sub, measuring 22cm x 45cm. Inside both you'll find a class-D digital amplifier and Digital Signal Processing. There are EQ and bass settings, too. With AirPlay and Bluetooth on board, it's no surprise to discover there's a free Minx Air app, too. Available for Apple and Android, it will let you browse internet radio stations and allow you to store presets. There's also a standard remote control in the box. Cambridge Audio claims both speakers are nice and easy to get set-up but there are set-up video guides online and on the Minx Air app should you need extra guidance. On sale now from Cambridge Audio or Richer Sounds, the Minx Air 100 is £330 and the Minx Air 200 is £430.